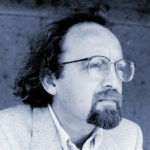 Brian Ferneyhough is a British composer, who has resided in California, United States since 1987. His work characterized by highly complex notation and the extensive use of irregular nested rhythmic tuplets, Ferneyhough is typically considered to be the central figure of the New Complexity movement. Ferneyhough taught composition at the Hochschule fur Musik Freiburg and the University of California, San Diego, and currently, Stanford University, and is a regular lecturer in the summer courses at Darmstadter Ferienkurse. "When I left Europe in 1987 I did so with the thought that my relevance as a composition teacher would benefit from a certain cool distance to certain tendencies I had been observing for several years with increasing disquiet." "Certainly being in California has encouraged a sustained commitment to rethinking the nature, purposes, and relevance of the contemporary arts, specifically music, for a society which by and large seems to manage quite well without them." "Questioning the nature and implications of liminal instances necessarily involves failure, if only in the specifically technical sense of entering spaces where prevailing criteria of success scarcely apply." "With respect to the respective French and German traditions you are no doubt correct, although I am reluctant to see individual achievement reduced to archetypes." "When I speak of “cycles,” I am referring to lengthy intervals of relative homogeneity, if not in the resolving of problems, than at least with respect to the consistency of their capacity to productively irritate."